Studying the art of the Islamic world is challenging, partially because of the large geographic and chronological scope of Islam. Islam has been a major religion and cultural force for over fourteen centuries and continues to be so today. At present the Arts of the Islamic World Section is organized into three chronological periods: Early, Medieval and Late. These chronological divisions are modern creations that help scholars to organize information and works of art to interpret them better. It also helps students to understand how works of art and architecture relate to each other in time and space. There were dynasties and empires that controlled different lands and whose periods of rule stretched across these chronological divisions. After Muhammad’s death in 634, there were four caliphs later referred to by the Sunni as “rightfully guided,” who succeeded Muhammad. However, from 656 there were conflicts over succession, and two civil wars (656-661 and 680-692) broke out within the community of Muslims. Out of these wars emerged the Umayyad Dynasty, whose capital was Damascus in modern-day Syria. 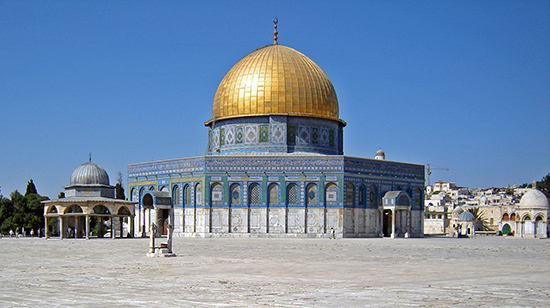 Responsible for the first great monuments of Islamic art and architecture, Umayyad rulers built the Dome of the Rock in Jerusalem, the Great Mosque of Damascus, and the so-called Desert Palaces in Syro-Palestine . The Umayyads ruled as caliphs until 750 C.E., when they were overthrown by the Abbasids. The Abbasids, like the Umayyads before them, ruled as caliphs over much of the Islamic world until 861. Their capital was at Baghdad, and later they ruled from the palace-city of Samarra in Iraq for parts of the ninth century. After 861, the Abbasids lost control of large parts of their empire through a series of uprisings in which provincial governors asserted their independence. A series of local dynasties, such as the Aghlabids (800-909) and Tulunids (868-905) in North Africa, and the Buyids (945-1055) in Central Asia, emerged and ruled, developing regional artistic styles. By the tenth century, there was fragmentation and individual dynasties sprang up. These dynasties had varying degrees of control over different parts of the lands where Islam was the dominant or a major religion. In North Africa and the Near East, certain major dynasties, such as the Fatimids (909-1171), emerged and ruled an area that includes present-day Egypt, Sicily, Algeria, Tunisia, and parts of Syria. It is also at this time that some of the major Turkic dynasties and people from Central Asia came to the forefront of politics and artistic creativity in the Islamic world. The Seljuqs were Central Asian nomads who ruled eastern Islamic lands and eventually controlled Iran, Iraq and much of Anatolia, although this empire was short-lived. The main branch of the Seljuqs, the Great Seljuqs, maintained control over Iran. It was also the time of the European Christian crusades, which aimed to retake the Holy Land from the Muslims. A series of small Christian Kingdoms emerged in the twelfth century, as did Muslim dynasties, such as the Ayyubids (1179-1260), whose most famous leader, Salah al-Din (r.1169-93), known in Europe as Saladin, ended the Fatimid dynasty. Eventually the slave soldiers, upon whom the Ayyubid dynasty depended for their military protection, overthrew the last Ayyubid sultan in 1249/50. These slaves, known in Arabic as mamluk, literally meaning “owned,” became known as the Mamluks and they controlled Syria and Egypt until 1517. The Mamluks also had to face one of the greatest threats to their reign early on: The invading Mongols. The Mongols and their great leader, Genghis Khan (c. 1162-1227), are almost always associated with blood-thirsty conquest and destruction, but his legacy included the Yuan dynasty in China (1279-1368), the Chaghatay khanate in Central Asia (c. 1227–1363), the Golden Horde in southern Russia, extending into Europe (ca. 1227–1502), and the Ilkhanid dynasty in Greater Iran (1256–1353). The Pax Mongolica (“Mongolian Peace”) includes a great flowering of the arts. The Ilkhanids, who ruled over Iran, parts of Iraq and Central Asia, oversaw great artistic development in manuscripts, such as those that recounted the Shahnama (or Book of Kings), the famous Persian epic. They were important patrons of architecture. The Ilkhanid dynasty disintegrated in 1335 and local dynasties came to power in Iraq and Iran. In 1370, the last great dynasty emerged from Central Asia: the Timurids (c. 1370-1507). They were named for their leader, Timur (also known as Tamerlane), who conquered and controlled all of Central Asia, greater Iran, and Iraq, as well as parts of southern Russia and the Indian subcontinent. The Timurids were outstanding builders of monumental architecture. Herat, in present-day Afghanistan, became the capital and cultural center of the Timurid empire. While artistic production and architecture flourished in Asia under different Islamic dynasties, it also bloomed in the western Islamic lands. 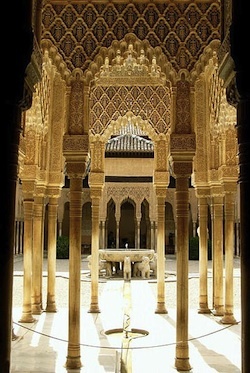 The most famous of these dynasties is probably the Nasrids (1232-1492) of the southern Iberian Peninsula and western North Africa, whose most important artistic achievement is the remarkable Alhambra, a palace-fortress complex in Granada, in present-day Spain. This period is the era of the last great Islamic Empires. The Ottoman Empire, which had started as a small Turkic state in Anatolia in the early fourteenth century, emerged in the second half of the fifteenth century as a major military and political force. The Ottomans conquered Constantinople in 1453 and the Mamluk Empire in 1517. They dominated much of Anatolia, the Balkans, the Near East and North Africa until the dissolution of the Ottoman Empire after World War I. The Ottomans are famous for their domed architecture and pencil minarets, many of which were built by the great architect, Sinan (1539–1588) for Sultan Süleyman (r. 1520–66). This period is considered the peak of Ottoman art and culture. The Safavids, who established Shia Islam as the dominant faith of Iran, ruled from 1501–1722 and were the greatest dynasty to emerge from Iran. Architecture, paintings, manuscripts and carpets all flourished under the Safavids. Shah Abbas (r. 1587–1629) was the greatest patron of the arts and the Safavid Dynasty’s most outstanding ruler. In the eighteenth century, a period of turmoil in Persia, the Qajar dynasty (1779–1924) rose to power and established peace and their rule saw the beginning of modernity in Iran. The other great dynasty that oversaw a remarkable artistic and architectural output was the Mughals. Founded by Babur, the Mughals (c. 1526–1858) ruled over the largest Islamic state in the Indian subcontinent. While there had been earlier sultanates in what is today northern Indian and Pakistan, the emperors of the Mughal dynasty were patrons of some of the greatest works of Islamic art, such as illuminated manuscripts and painting, and architecture, including the Taj Mahal. Cite this page as: Dr. Elizabeth Macaulay-Lewis, "About chronological periods in the Islamic world," in Smarthistory, August 8, 2015, accessed April 21, 2019, https://smarthistory.org/about-chronological-periods-in-the-islamic-world/.